A motorcycle rally is a gathering of motorcycle enthusiasts who want to come together for some common purpose. The purpose of rallies varies greatly. Some rallies are designed to bring certain types of bikers together. Some rallies are designed to do good works for the community. Whatever the purpose, bike rallies can bring people together, provide companionship, and create good will among bikers. My favorite rallies are rallies that are designed for women, by women. I don't know about you, but I find that women who are dedicated bikers are just very interesting people. There's no way to stereotype them or pigeonhole them. You can't say, "All female bikers are like this..." Going to a women's bike rally provides me with an opportunity to meet women from all over who are doing amazing and inspiring things with their lives. It's not unusual to find women at these rallies that have come to biking after some sort of radical event in their lives. One woman might have picked up biking after her husband of twenty years left for a new life with someone else. 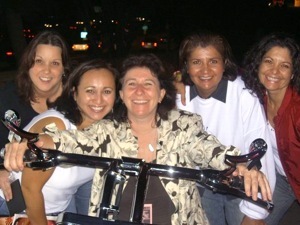 Some women come to biking after undergoing a serious illness. Some women just feel that the time is right in their lives for them to be riding. Talking to women and learning their stories is a highlight of bike rallies for me. Most bike rallies are weekend events. You show up Friday night and you set up where you're staying. There is usually entertainment on Friday night and through Saturday. Often, there are structured events, such as a ride on Saturday or some competitive events. Typically, there is a party Saturday night, and everyone clears out by noon on Sunday. Some bike rallies are designed as community events and can be structured as fundraisers. These events will typically include educational opportunities for the participants, vendors at the event who are selling gear and other bike related articles, and contests or competitions. These events stress safety and education and they are help responsibly. If the rally attendees behave responsibly, these events are typically well received by the public. As if often the case, a few bad apples can spoil the bunch. If a group of people show up to a rally and don't behave themselves or behave irresponsibly in the community, this can ruin the rally for the rest of the people attending. If you are thinking about attending a rally, understand that a lot of hard work goes into planning these events and a lot of people are hoping the event will be successful. The people who plan the event typically live in the community where the event takes place. They have to live there after everyone leaves, so if there is any flak, they're the ones to catch it! Rallies come in all shapes and sizes, but women's rallies tend to have a special atmosphere of camaraderie and friendship. Women tend to get together to support each other, whether it's through biking or some other means. If you haven't attended a women's bike rally, take some time and check some of them out. Lots of them have websites on the Internet where you can see the details. Many will post photos from past events so you can see what others have done. These rallies are a great time and you'll leave feeling pumped up about being a motorcycle rider.